The Plastic Diaries: But what does 'Plastic' mean? But what does 'Plastic' mean? I have been thinking about what the word plastic has come to mean within our society. In the research I’ve been doing for the book I’m trying to write about plastic, I keep coming across one particular quote. ‘I want to say one word to you; just one word,’ says Mr. McGuire to Benjamin Braddock in the iconic 1967 movie, The Graduate. ‘Yes, sir,’ replies Dustin Hoffman’s character, Benjamin. In the 1960’s plastic was just coming into its own. It was the way forward, the chosen material of the space age. Despite being mid-Cold War, the 50’s and 60’s are generally regarded as being optimistic and forward-looking decades, and – with the launch of post-war economy-boosting plans to get everyone buying, buying, buying – decades of material affluence. ‘The optimism of life in those decades was accompanied by a ‘throw-away’ approach to material goods, a short-term relationship between people and their possessions,’ writes Penny Sparke in The Genius of Design. 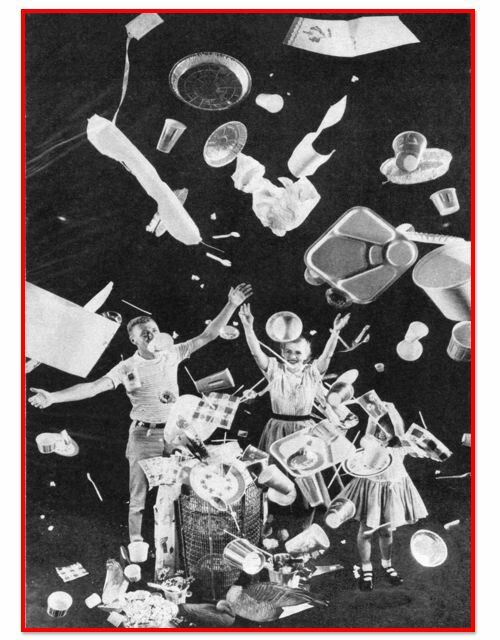 And this is very much epitomised by the now famous article in Life magazine, ‘Throwaway Living: disposable items cut down household chores’. Plastic was the future, the ‘stuff of dreams’ (Penny Sparke). But – and this is one of the most interesting things for me – this idea of plastic as cheap and nasty, and representative of bad taste, has led the word to take on a whole different meaning. ‘In the sixties, you could always insult a guy by calling him ‘plastic,’’ Elizabeth Royte tells her readers in Garbage Land. ‘The word became a kind of shorthand for a suburban life of conspicuous consumption and upward striving.’ Plastic people, plastic culture – it’s become synonymous with fleeting, throwaway ideas, with being shallow and worthless. Everybody understands this, and this concept has fully insinuated itself within society and language. And yet the use of plastic has risen and risen, and is now the most produced material in the world, millions of tonnes of it every single year. If everybody hates it and looks down their noses at it, how did this happen? Five minutes after I asked a lady at work what she thought of plastic – to which her response was, ‘I don’t like it’ – she’s tucking into her plastic-sealed lunch. Is it because plastic as a material was just so innovative we couldn’t help but be tempted by it and what it could offer us? The more I think about it, the more I realise that humans are short-term thinkers. We look for easy solutions, the quick fix, the lazy option. Plastic has provided this for us in ways that were probably never even imagined a hundred or a hundred and fifty years ago. How could we say no once it was there? Let’s face it, plastic revolutionised the way I live. It made things affordable to people who could never have afforded such things if they weren’t made of plastic, and who am I to say they shouldn’t be allowed to have them if they want them? Who am I to tell someone they can’t strive for a better lifestyle? And as long as people were buying plastic – despite the increasingly negative thoughts being attached to it – companies continued to make it. Penny Sparke’s book, The Genius of Design, was produced to coincide with a recent BBC2 series of the same name. It was a five part series looking at all sorts of different aspects of design, including a whole episode dedicated to plastic (‘Better Living through Chemistry’), which was incredibly fascinating. Unfortunately, the episode doesn’t seem to be available to watch online at the moment, but the whole series can be bought on DVD – ironic, given as DVD’s are a typical example of how plastic has shaped modern living. I enjoy reading your blogs Isobel, you are always thoughtful and considerate. This present blog is a good example.